Participants sing "How Great Thou Art" to wrap up the National Day of Prayer event on Thursday on the State House front steps in Augusta. The singing was preceded by the reading of a proclamation by Gov. Paul LePage and the reading aloud of the 2013 Prayer for the Nation. The event also included a prayer walk around the State House and the city of Augusta. Participants sing “How Great Thou Art” to wrap up the National Day of Prayer event on Thursday on the State House front steps in Augusta. The singing was preceded by the reading of a proclamation by Gov. 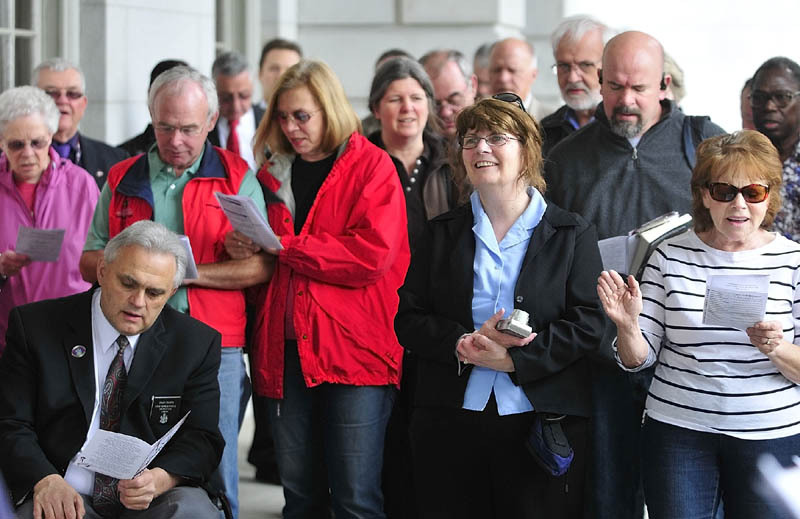 Paul LePage and the reading aloud of the 2013 Prayer for the Nation. The event also included a prayer walk around the State House and the city of Augusta.